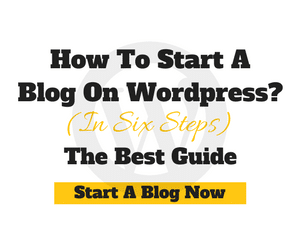 Nowadays many of you showing a huge interest to jump in blogging or Online business. Definitely, this is the right decision you’ve taken so far. For rich people starting a blog or website is not a hard thing they will easily invest but most of the people struggle to invest money. Few of them give up their dream early because they can’t afford on web hosting. Web hosting is costlier than buying a domain. But did you know? One company still exists in the market which gives almost everything for totally free. Almost you get what you get on premium hosting. It’s 000webhost.com the best free web hosting company for personal blogs and websites. Need more information then read my complete 000webhost review and find out its unbelievable features and performance. Usually, I don’t trust free hosting cause they have hidden secrets and dirty tricks do to earn money from our websites. But 000webhost is the legit and free web hosting company and it is the one and only web hosting company you should consider if you want to try free hosting service for your company. OOOwebhost is on the internet since 2004 and servers millions of free web hosting websites with their own best servers and the company is part of the ICANN accredited registrars. With having millions of users on the free servers they always receive feedbacks about what customer needs and simply delivers or upgrades to latest technologies day by day. Let’s see the real value of 000webhost in my 000webhost review one by one. The free hosting is mainly started for this purpose alone where the web hosting company places some ads on your website without permission where they enjoy the revenue without sharing it with you. But in 000webhost they will not run any ads and also allow your own ads to run without any limitations. This is the best pros from 000webhosting where they allow best website software like PHP and MySQL. Did you know? You will get these features from Cheap hosting plans but here it’s absolutely free. Forever! 000webhost never play cheap tricks by suddenly changing the hosting from free to paid. As long as you host you will get everything for free. Need free hosting for 10 years? Yes, you can get it. I don’t know any other Free WordPress hosting has this features or not? For nothing, they are giving you the free website builders. This helps you to build your website without typing any codes and this is my favorite part because I don’t know coding. 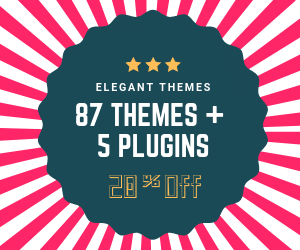 Normally WordPress themes like Genesis themes cost about $50 – $60 and that too you have to pay renewal amount each year. In 000webhost you get 100 of website templates at $0. Stunned? I never saw any free web hosting provider giving latest Cpanel for absolutely free. If some host gives means believe me what you see it’s not the latest Cpanel instead an old one. 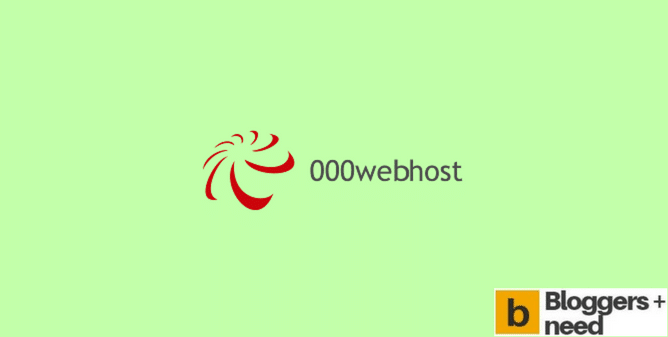 But 000webhost will give you best Cpanel where you can maintain and manage every information of your website securely. Do you have visitors with different languages? Then show your website in their own language and this is the the best feature for global audiences. Protect your private directories with a password and this rule will be created in the htaccess file. If some visitors visit the particular he/she needs to provide the username and password to log in and view the protected directory file. Uptime is the most important thing for any website, Uptime makes your website always visible by 24/7/365 without any error. But downtime is natural and it happens due to nature or man-made mistakes. we can control it! I still believe free hosting will never give least 80% of Uptime because free hosting will never give and its the universal truth. With having the best server from 000webhost your website gets almost 99% of uptime guarantee. Again stunned? Wait once again they have more stunning information on their official website. This affects me so much about using 000webhost 1-hour sleep but Again this is not cons because premium hosting too have some downtime even several premium web host had more than 3-4 hours in the past. Unlike other free web hosting providers 000webhost doesn’t use any low class services instead uses the best servers with gives the reliable hosting performance. 000webhost uses Hostinger cloud servers and they even record and monitor all their domains and subdomains daily uptime timing. 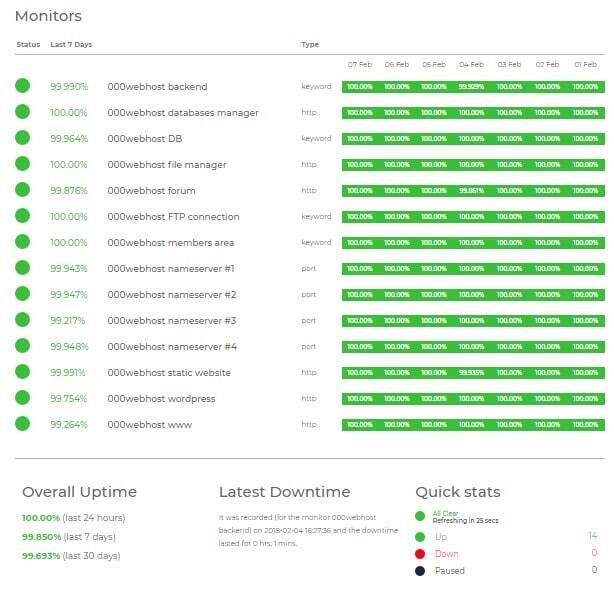 Here is the screenshot of the weekly uptime performance of their nameservers, forums, backend, FTP connections and much more. No other free web hosting will give 99% of uptime guarantee so don’t wait to host your website. Sign up now! yes, 000webhost has some premium hosting plan at a cheaper price. Premium Silver Hosting: Costs $3.95 per month and allows you to host unlimited websites with 3X website loading speed. 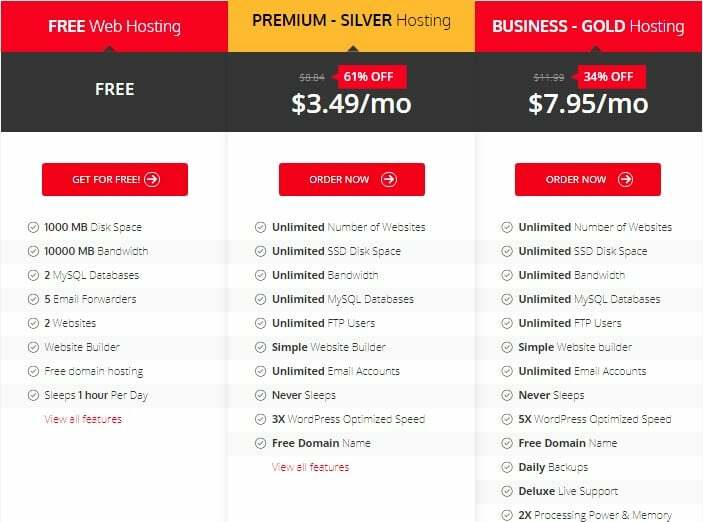 Business Gold Hosting: Plan costs $7.95 monthly this also allows you to host an unlimited website but here your website will get 5X website fastest loading speed. This plan is best for high-level traffic websites. 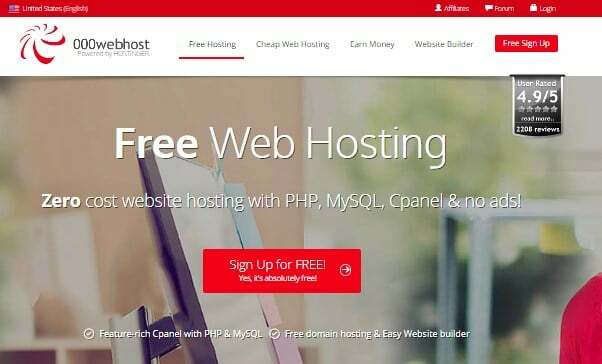 000webhost is absolutely the best free web hosting company and they are honestly open with their terms and conditions. Surely if you are a new blogger or looking to host a website with premium features then I will vouch for 000webhost to you. Thanks for reading my 000webhost review and I am also looking your opinions about 000webhost kindly drop in the comment box. I recommend Ipage web hosting which is so cheaper and the best hosting to host.